Earlier in her instagram live, Dara mentioned that CL kept on calling her and that she couldn’t answer because she was in the studio. And she cutely said, ‘Chaerinnie, please stop calling me!” Kekeke! I guess finally they were able to talk to each other! So cute! 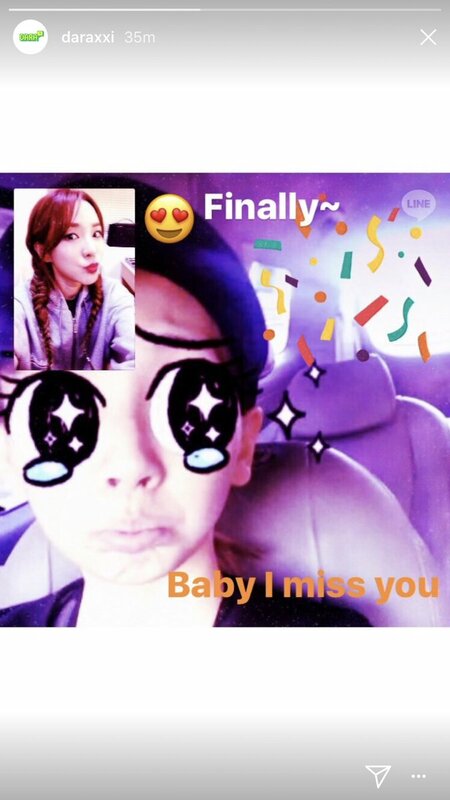 Sweet Dara used the hashtag that Blackjack is trending for their 8th anniversary! Q. “One Step” is your first ever Korean film. Don’t you feel pressure about debuting as a movie actress? Sandara: I didn’t feel any pressure about it because I tried my best at every moment and I was confident in myself. However, I couldn’t sleep well after having a movie premiere yesterday. I don’t know why, but I was so nervous. Q. How about Minzy? She didn’t attend the movie premiere. Sandara: Even though she couldn’t attend the event due to her busy schedule, she called me to support me. There seems to be some misunderstanding, by the way. 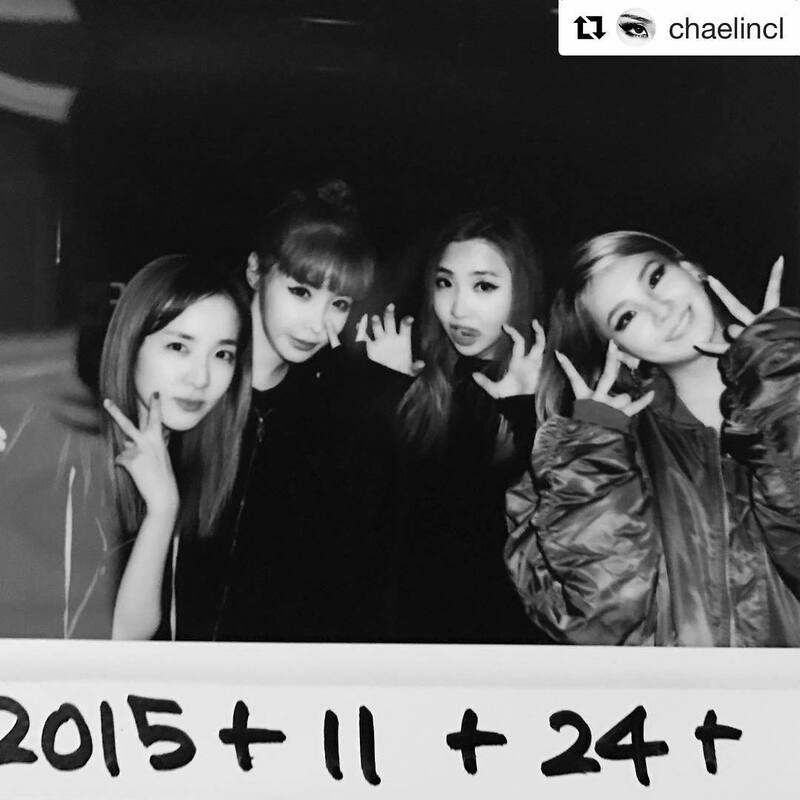 Some people say there was some discord among us when Minzy left 2NE1. It’s not true. We’re still in a good relationship. Q. Tell me about the breakup of 2NE1. Didn’t you have any choice except to disband the team? Sandara: Actually, I’ve been thinking about it since we were a 3rd-year girl group. I didn’t want to part with them, but I knew we have to say good bye one day or other. It was very sad to part with them because we’ve been great friends for about 10 years. Sandara: No, even though 2NE1 has been disbanded, I will still sing. I will sing and act at the same time, and that’s why I’m preparing for my solo album. Sandara: I think my solo songs will be totally different from 2NE1’s songs. I want to try different things. For example, I want to sing very cheerful dance music. I hope I will release the album this summer. Q. Don’t you feel pressure to achieve a success as a solo artist? Sandara: When I was a member of 2NE1, so many people came to our concert. However, it seems like many people don’t even know about my movie. Well, I’m just trying to be positive. I’m not sure I can become as popular as 2NE1, but I know life is a succession of failures. I’ll challenge myself and never give up. Sandara: I think it’s because of my high voice tone, and it’s true I was once frustrated when I heard such a criticism. Actually, when 2NE1 released a ballad music, my part was very small because music producers said my voice tone didn’t fit such a music. So I tried to lower my voice tone, but it was not easy. However, I’ve changed my mindset after 2NE1 was disbanded. As I said, I’m trying to be positive, and I’ll try to strengthen my strength instead of worrying about my weakness. Q. Your new movie “Cheese in the trap” will begin shooting in April. Tell me about the movie. Sandara: As it was already made into a drama last year, I think we need to make it into a totally new version. The director of the movie wanted me to be myself, and I’ll try to show real me in the movie. I’m really looking forward to the movie. Visual Sisters Dara and Jisoo Fighting! ^_^ I love how YG Family secretly went out to support Dara! News: “Leaving the comfort zone of 2NE1 and getting into a battle field”… Sandara Park’s 3rd life. Sandara has shown a “true her” through music movie “One Step”. It was the first time she participated in a movie and played the leading role, which made it even more meaningful for her. Sandara Park debuted as a 2NE1 member in 2009 and being a singer for several years. She now has a brand new title – actress – due to the movie “One Step”. Dara is gradually showing herself as an actress from web drama to the movie. Although she says “Well begun is half done.”, she only rates her acting skill a 51 points. “I feel like I don’t really recognize myself. I never do. I’m the kind of person who cannot recognize myself. If 100 is maximum, I might get 51. But that is what beginning means, since there is a saying “Well begum is half done.” If I rated myself 100 it’d be like a poser.” She laughed. Well as for a teaser, we got a countdown timer, for 2ne1’s last single release. Who knows if we are going to have more teaser or this is just it.